Convenient parking is available for the Fiserv Forum. 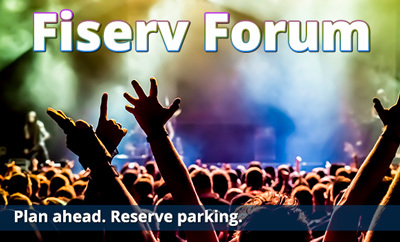 Save on parking for Milwaukee Bucks or Marquette Golden Eagles basketball games, concerts, and special events! Pre-purchase parking to enjoy a guaranteed space waiting for you at the garage. The Fiserv Forum is Milwaukee's newest multi-purpose arena. The venue replaces BMO Harris Bradley Center, and will be used for hosting sports and entertainment events.